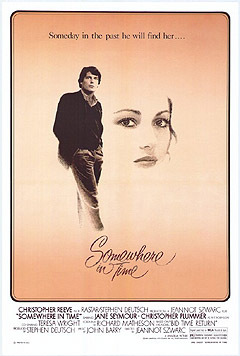 Upon seeing a portrait of a beautiful actress (Jane Seymour) from the turn of the century, a playwright (Christopher Reeve) wills himself back in time to romance her. Peary is typically blunt in his assessment of this “schmaltzy fantasy-romance”, based on a prize-winning sci-fi novel by Richard Matheson (who scripted numerous cinematic sci-fi classics, including The Incredible Shrinking Man and The Devil Rides Out). He notes that “Reeve and Seymour are an undeniably appealing couple, ideal for a great romance, but the filmmakers should have scuttled the dreary plot…, sent all the other actors home, and just had the two stars make love in every room of the glorious hotel.” (!!!). The film is problematic on numerous levels. Every scene is calculated to yank shamelessly at our heartstrings; as noted in Time Out’s review, the sappy story is “the kind of thing David O Selznick was producing in the 1940s”, and Roger Ebert accurately points out that it fairly “drips with solemnity”. Although it may be a reasonably common occurrence to find oneself falling desperately in love with a portrait from the past (viz. Preminger’s Laura, for example), the problem here is that we’re essentially asked to believe in and care about a romance based purely on “instinct”. Even once Reeve and Seymour meet in person as young lovers, we’re not given any earthly reason to understand why they’ve fallen for one another (though many, I suppose, would argue that this is exactly the point). Meanwhile, Reeve (in a role he handpicked after his extraordinary success in 1978’s Superman) simply doesn’t have the chops necessary to make us believe in his character; it’s painful to watch him so clearly acting at every moment. Seymour is luminous and lovely to look at, but can’t really do much to resurrect her underdeveloped role. Christopher Plummer (as Seymour’s controlling manager) is reduced to a few scenes of red-faced rage, while Teresa Wright (in a tiny role as the elderly Elise’s caretaker) is essentially wasted. Yes — but only for its cult status. First viewing. Yucky, gooey, plotless, characterless hogwash, no doubt aimed at die-hard romantics who care about nothing but hearing two beautiful people swear undying love for each other for no earthly reason except that they’re beautiful. It just goes on and unbearably on being its blissfully sappy, one-note self. Things do ‘perk up’ slightly towards the end when the film takes a sudden leap toward the laughable: the lovers finally go to bed and it’s the s-l-o-w-e-s-t descent imaginable onto a mattress; after being time-ripped from Seymour’s side, Reeve’s longing for her throws him into such an abyss that he places his cheek upon her portrait; last, and probably least, is the sight of Reeve reduced to a white-faced, catatonic puddle of unfulfilled desire. Not even composer John Barry can call on his often dependable powers. His work here is largely uninspired. Moment that made me giggle: Plummer refers to Seymour’s character as possibly “the greatest actress of her generation.” Why would that be?, I wonder.